Here is the very beginning of my next stitching project. This pretty little flower is from “Heart in Bloom” which is at the back of the book “A Stitcher’s Journey” by Blackbird Designs. I’m stitching this as part of the wedding gift for my niece and her fiancé, but I’m not too worried about blowing the surprise here, because I seriously doubt that either of them reads my needlework blog. But should they stumble across it, then surprise – and happy upcoming wedding! I haven’t decided yet how I will be personalizing the piece yet, that’s something I will be thinking about while I stitch it. That’s enough to make me want to buy the book. Thanks for sharing. 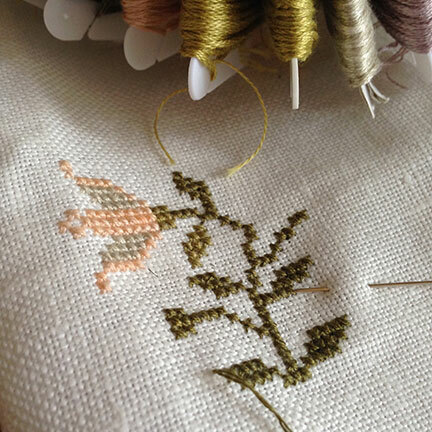 “A Stitcher’s Journey” by Blackbird Designs has many lovely little cross stitch projects inside and is well worth it!